Today’s dreary weather has me in the mood for something warm and hearty. Nothing compares with baked beans for easy, cheap comfort food – “comfort” being determined by price and simplicity, as much as flavor. People living in North America have been using the syrup from maple trees for centuries. At the Culinary Institute of America, the curriculum on maple syrup includes a bit of Indian folklore suggesting that a great hunter by the name of Woksis was one of the first to discover maple syrup. He had apparently swung his axe into a maple tree and discovered that the tree “cried” sap from the gash in the bark. The sap collected in a vessel beneath the tree, and Woksis’s wife, thinking it was water, used it to prepare a stew. As she heated the water she noticed its sweet smell and taste, and realized that it was not water, but the first batch of maple syrup. It takes about 40 gallons of the golden brown maple sap to make one gallon of syrup. Maple syrup production, or “maple sugaring,” begins anytime from February through last month. The Northeast is the only place where natural conditions exist for maple sugaring. New Englanders produce 1.2 million gallons, to a tune of $40 million to $50 million annually. According to Chef Bruce Mattel of The Culinary Institute of America, using maple syrup in recipes adds a woodsy sweetness unmatched by refined sweeteners. He also notes that the addition of maple syrup can cause baked goods to brown more quickly, so be sure to adjust your oven temperature slightly. 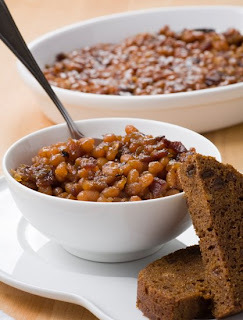 The Culinary Institute of America’s Maple Syrup Baked Beans is a sweet New England classic with a deep, rich flavor. You can cook this recipe in the slow-cooker (if you want the simplicity of one-pot dining.) Just let the soaked beans cook on low 10-12 hours. Drain the beans and place them in a pot with enough fresh, cool water to cover. Bring to a boil over medium-high heat; reduce heat and simmer for 2 hours, or until a bean is tender enough to mash easily. Preheat the oven to 325 degrees. Drain excess water from the beans and place them in an ovenproof casserole. Cook the bacon over medium-high heat in a heavy skillet until limp. Using a slotted spoon transfer the bacon to paper towels to drain. Add the bacon to the beans. Discard all but 2 tablespoons of the rendered bacon fat in the pan. Add the onions and cook over medium-low heat until tender and slightly brown. Add the onion to the beans. Add the maple syrup and mustard to the beans and stir to blend thoroughly. Cover the casserole loosely with foil and bake in the preheated oven 2 to 3 hours. If the beans seem too dry, add up to ½ cup water. The beans are done when the liquid is very thick. And here’s a simple accompaniment from Baking at Home with The Culinary Institute of America cookbook (2004 John Wiley & Sons, Inc.). Preheat the oven to 375 degrees. Generously grease an 8 1/2-inch loaf pan or a 1-pound coffee can with cooking spray. Pour the boiling water over the raisins and let plump for 10 minutes. Sift the flours, cornmeal, baking soda, and salt into a bowl. Make a well in the center of these dry ingredients and set aside. In a separate bowl, beat together the buttermilk, molasses, and egg. Drain and stir in the raisins, discarding the plumping liquid. Pour the wet ingredients into the well in the dry ingredients and mix just until the batter is smooth. Pour batter to the prepared loaf pan or coffee can. Cover the loaf tightly with aluminum foil, then place it inside a larger pan or casserole (the sides of the larger pan should be taller than the loaf pan). Pour enough boiling water into the large pan to come halfway up the sides of the loaf pan. (If you are using a coffee can do not fill the can completely; leave at least one inch at the top for the bread to rise while baking. Cover the can with plastic wrap and then with aluminum foil. Place the filled can in a stock pot or similar large pot with ovenproof handles. Add enough boiling water to cover about two-thirds of the coffee can. Depending on the size of the pan, you may have some batter left over.) Tightly cover the larger pan with foil and place in the preheated oven. Bake undisturbed for 2 1/2 hours. Insert a skewer into the center of the bread. If it comes out clean, the bread is done; otherwise, continue to bake another 15–20 minutes. Do not open the oven door while the bread is cooking, to keep the temperature consistent. When the bread is done, remove the loaf pan from the larger pan and remove the foil. Let the bread cool in the loaf pan or can for 10 minutes, then loosen the edges, turn the loaf out onto a wire rack, and cool slightly. Serve while still warm.